Sorry it's been so long, I'm still getting used to this blogging thing. Today I have for you an older nail art that I did but haven't posted here yet. 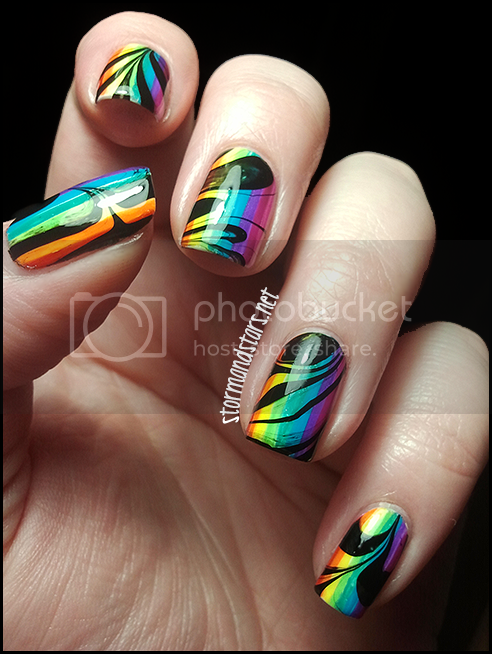 I had wanted to do a watermarble using black and clear over a gradient, but when I got a whole bunch of stripers from the Dollar Tree I started thinking rainbow stripes instead. The following is the result of a quite time consuming mani which was totally worth it! I didn't want to take this one off! OMG!! I love how this came out so much!! Please read more after the break! To do this manicure, I started with a base of two coats OPI Alpine Snow, which is a pure white. 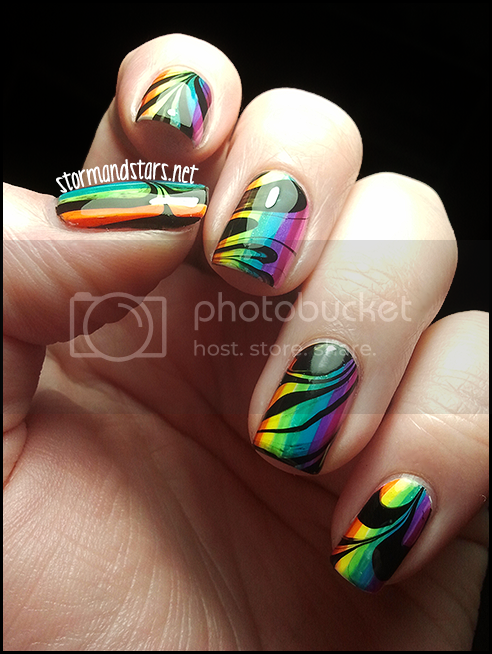 After the white, I used my stripers to freehand the rainbow stripes along the nail, then I used Seche Vite topcoat and let it all dry. 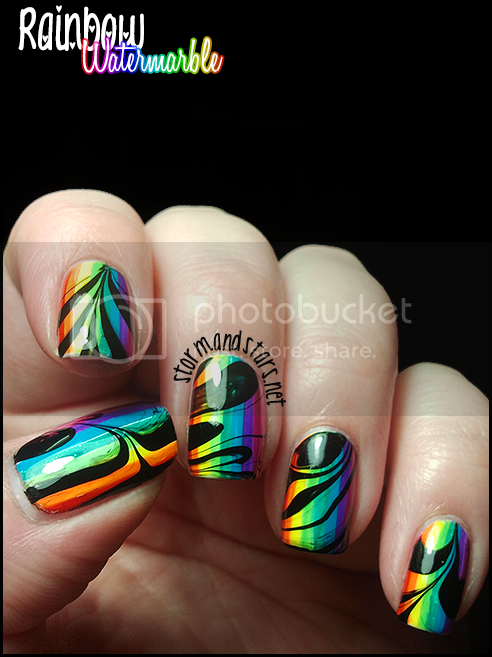 After everything was dry I used Cult Nails Nevermore and Sally Hansen Insta-Dri in Clearly Quick to watermarble random designs over the rainbow stripes. I top coated one more time once the marble was dry. I definitely want to try this design again with different designs under the marble and different color combinations! The possibilities are endless!! Cult Nails polish retails for $12.00 a bottle and can be found at their website. Sally Hansen can be found at most retailers including CVS, Walgreens and Rite Aid. I found the striping polish at Dollar Tree for $1.00 a bottle. All products in this post were purchased by me with my own money. This looks incredible. 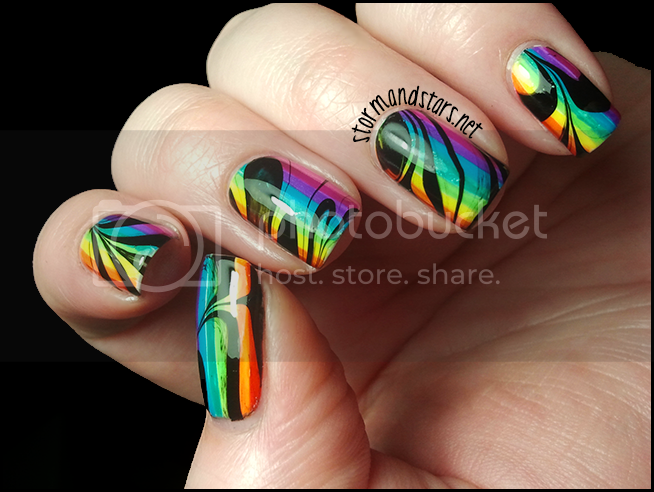 I've been dreaming about a rainbow mani with black nail art on top. This is a very pretty mani. I may have to try this soon. Good job. I'm the one bothering you from your instagram! Sorry! 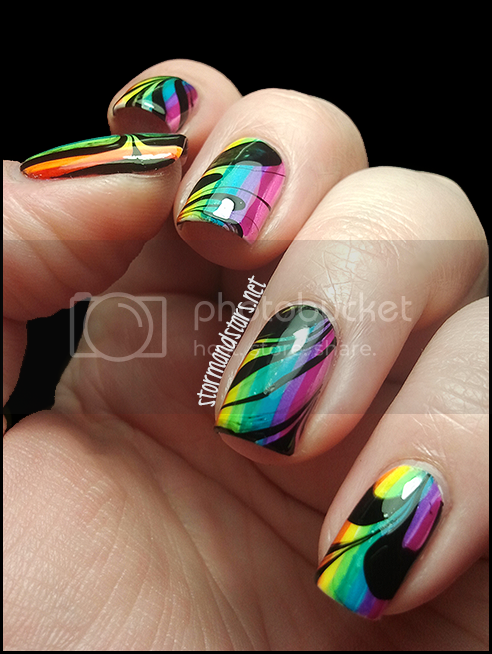 I tried to do this manicure a while back (with X-mas color stripes underneath) and when I tried to water marble with the clear polish, it dried immediately and would not work. I tried it with both Seche Vite and Sally Hansen Hard as Nails UV top coat and no luck! It's so gorgeous, I wish I could get it right! I just wanted to say that I'm truly impressed by your designs...U are very talented and I couldn't help but join your site; I usually just follow thru google reader. U inspire me to practice and perfect my nail design skills. Keep it up. 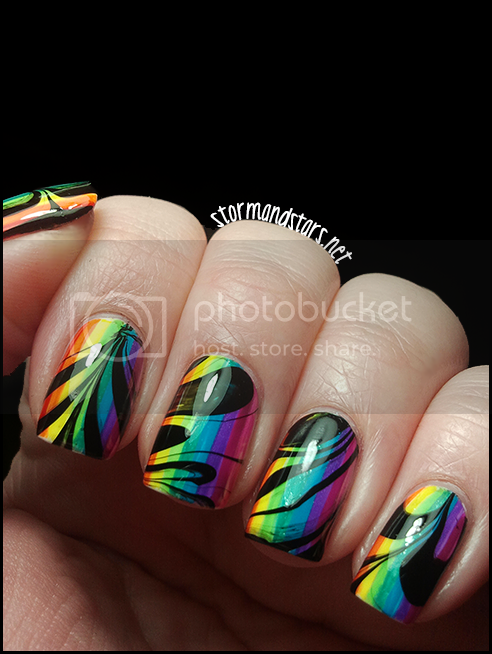 I didn't know you could water marble with clear... I figured it would dry too fast. Ohhhhhhh, the possibilities!